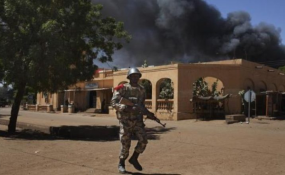 Officials in Mali have put the death toll from Sunday's militant attack on an army camp in the village of Dioura at 23. Suspected jihadists briefly seized the base in the central Mopti region, of which Mopti city is the capital. destabilize the country," he said. Officials blamed Sunday's attack on deserter army colonel-turned-terrorist leader Ba Ag Moussa, who is said to be close to a Tuareg militant chief with ties to al-Qaida.